Yesterday I went on my yearly visit to International Jewellery London to support my clients and also in the search of new jewellery talent. Within ten minutes of arriving I found Cara Tonkin's collection and was pleased to have successfully completed my task. Cara's jewellery is beautiful. With elegant designs and a unique bold aesthetic, which travels through the five collections, Cara's collection is a perfect fit for the stylish, contemporary and independent women. 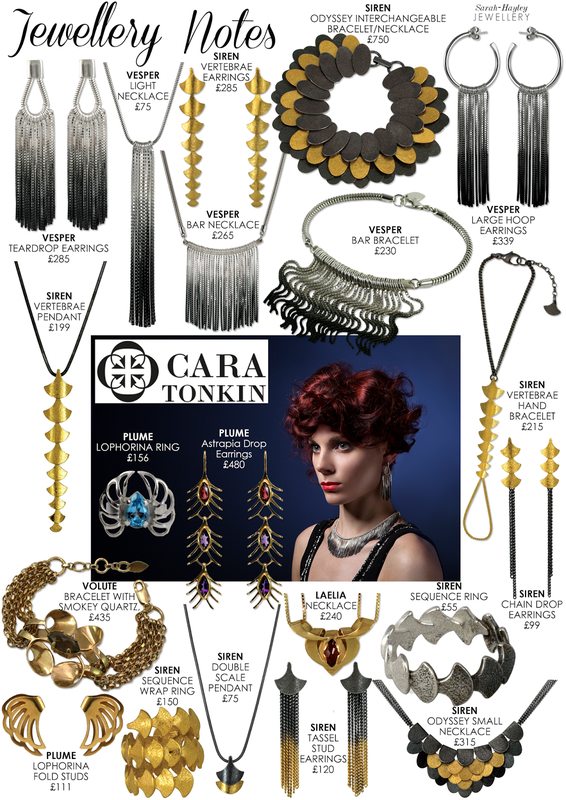 Cara blends modern shapes with a nod to the Art Deco and Art Nouveau period and fuses these inspirations to create unique, timeless pieces with a streamlined yet sculptural quality. Cara graduated with a First Class degree in Jewellery Design from Central St Martins and set up her namesake brand in Brighton. I have found my favourite pieces within the five collections Siren, Vesper, Volute, Plume and Laelia. I love the tactile quality of Cara's jewellery which works wonderfully with the current Autumn Winter 2014 'tactile texture' trend.